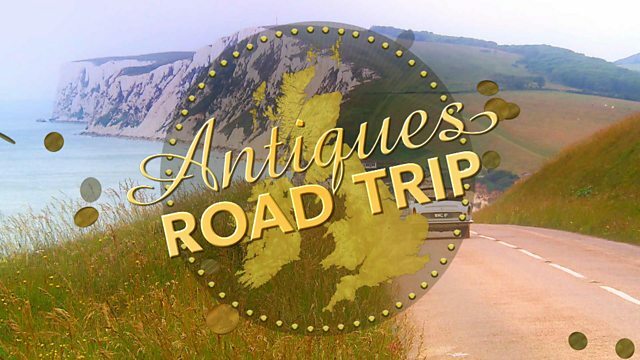 As antique experts Phil Serrell and James Braxton begin the second leg of their road trip, Phil has some catching up to do. competing for Road Trip glory in not so sunny Scotland. -It's a right dreish day. -I think you'll find it's dreich. -I didn't know you spoke Scottish. I know, it's amazing. It's just being here, it just comes back. James Braxton is a sucker for new finds. sort of the hairs on the back of my neck start tingling. the old adage, one man's trash is another man's treasure. But sometimes it's just rubbish. and on today's second leg, there's just under £39 between them. auction, meaning he's got £213.58 to spend today, bless him. giving him the lead with £252.56 to use as they hit the road again. -You are one of life's smilers, aren't you? I've never been a great smiler. Your face looks slightly odd when you smile. Your face sits slightly better with the curmudgeonly look. It seems to help him get good deals, though. The chaps are back in the awesome 1955 Austin-Healey. It's a snug fit for the fellas, so they should try and play nicely. cos I thought I was robbed yesterday. Absolutely robbed. -You weren't. Must have been an embarrassment. Well, the profits speak for themselves, Philip. Lancashire, Cheshire, Merseyside and winds up in Newport in Shropshire. in the Borders down to auction in Kendal. -The Scottish Borders are beautiful, aren't they? You get a thumping great river rushing through it. The Scottish Borders cover about 1,800 square miles. For around 300 years, this land was home to the Reivers. William Wallace is said to have helped defeat the English. Today, it plays host to a new battle, Braxton vs Serrell. -a lot better than I do. -So you ask them? I ask them. Quite clever, isn't it? Don't you do that? My plan was five legs, try and make sort of 50 or 80 quid a leg. -I've fallen at the first hurdle. -That's the beauty of this business. So it's time for Philip to get back in the game. -James, this looks like heaven for me. -See you later. Have a good day. -I wonder if there's a pot of gold over there. Blimey. You've got some good things in here, haven't you? so the showroom is like an Aladdin's cave, crammed full of goodies. -I think I've got a touch of the Elgar about me. just over £200, he needs to tap into some bargains. -This chair is interesting, isn't it? -It is a beautiful chair. -Yep. I think it's really fun. -I was thinking it could have been a barber's chair. -so it's actually got a dentist mark on it. -And how old is that? 1920s? -half of his budget on one item. -What's that there? Is that a chaff cutter? was manufactured by a company called R Hunt & Co.
You put your ears of corn in there and what does it do? Chomp it all up? James Braxton reckons I'm always going and buying agricultural tut. In a way, I'm tempted to buy just to sort of prove him wrong, really. Well, we can have a look round, can't we? I like your style, Phil. Not committing until you're satisfied you seen everything. It really is glorious scenery. so-called due to its proximity to the River Tweed. by Sir Walter Scott in his novel, Saint Ronan's Well. and he's hoping shop owner of 20 years Margaret Maxwell can help. and rather than asking Margaret for hers, he's diving straight in. That's quite unusual. San Francisco. Nice, British Overseas Airways Corporation. It has a real '60s feel about the whole thing. Would something like £20 be a fair price for that? -I think that might be tricky for that one. -I didn't have my glasses on! Perhaps you should look at the price tag properly next time, old bean. But Margaret has dug out something else to try and tickle your fancy. -What's this? This looks quite nice. -..is known for its copper, isn't it? Yes, it is. That's what I was thinking. I like this band going around it. -And it seems to be double skinned, doesn't it? Rather interesting. And how much have you got on that one? or both sides could have different patterns. a copper bowl has the potential to do nicely at auction in Kendal. There's something lovely about copper, isn't there? -Can I squeeze you a bit? Would you do it for 30? I'll take it, Margaret. That's very kind. Thank you. Right. And James is first off the blocks with his Arts and Crafts bowl. -to go down the old proverbial. -Most people would see a lavatory seat, wouldn't they? But all I can see is a portrait frame. I could just see Braxton's head in that, hung on the wall. Fantastic. Charming! I wouldn't spend a penny on that. Well, not Braxton's face. as well as the dentist's chair. and the grinder, I think that's £30-50, £40-£60 worth. -I'll buy the three bits for £120. That's pushing it out for you. -and he needs to make up for yesterday's shortfall. the corn grinder for £40 and the loo seat for £15. centre and across the River Tweed to Traquair House. Dating back to 1107, Traquair is Scotland's oldest inhabited house. when the 1st Laird of Traquair took up permanent residence. Catherine Maxwell Stuart, the 21st Lady of Traquair. -So, what's it like, living in a castle? I feel really privileged to have been born and brought up here. My children are doing the same. which often put her ancestors at odds with society. the Protestant monarchy of Great Britain. of the Stuart kings when it was not the right time to do so. And also Catholics which, again, put them on the wrong side. But you managed to survive, there's great tenacity through your family. Yes. I think they were canny Scots. the 4th Earl of Traquair's sister-in-law. who was captured taking part in the rebellion. he was sent to the Tower of London to await execution. imprisoned in the Tower and he was going to be executed. In fact, he had got to point of writing out his execution speech. to really thank everybody in your life. So there was a formality to it. It was a well trodden path, wasn't it? The date was set but Lady Winifred couldn't accept her husband's fate. She travelled almost 400 miles to beg the king for a pardon. she took matters into her own hands, with the help of her servants. and so on one occasion she went in with her maid servant. The husband swapped clothes with the servant, who was wearing this cloak. and managed to rescue the maid servant as well. It's a humble cloak, isn't it? Well, it would have been the maid servant's cloak. The three escaped to France. They were never able to return. -was known as the Nithsdale. and succeeded by his Protestant son-in-law. -Tell me about these splendid gates. and things were going very well then. until a Stuart king returned to the throne. which took 1,000 lives and led to the end of the Jacobite rebellion. where a Catholic monarch still reigned. To this day, these gates have never been reopened. edged his way further into the heart of the Borders to Galashiels. Before the Jacobite rebellions, this was territory for Border Reivers. by local sculptor Thomas Clapperton immortalises the Border horsemen. shop owner, Kenny Philip, is ready to help him part with even more. -Hello. Pleased to meet you, Philip. after leaving a career in the local textile industry. a remarkable collection to tempt Philip. -Tell me about that then, Kenny. Obviously made somewhere between the Boer War and the First World War. -It has been hand done silk work. -Hugely emotive as well, isn't it? -You know, because war was a bit barbaric in those days. -That, I'm looking for about £395. It's lovely but it is way, way, way out of my price range. who is usually more partial to the peculiar. -Kenny, what's the ticket price on these, please? -The pair? I'd be looking for about £130. -You haven't got a chair, have you? I just feel myself going all faint. -What might be the best you could do for the one? Wow! That's a huge drop! I really like the extinguishers but one is damaged. so I'd really need to try and buy it for £25. -that are right up Phil's street. -How old do you think that is, Kenny? It's got February 8th, 1898. I'm just not convinced it's as old as you think it is. I think that it's probably more like '30s. Can I squeeze another fiver off you? and I think I could squeeze a fiver off. You are a gentleman, mate. Thank you very much. Philip, sitting down worked out well for you after all. That's a fantastic deal for £25. James is lagging, having only bought one item. He'll need to be on top shopping form tomorrow. But for now, off to bed with you chaps. back behind the wheel of the open top Austin-Healey. -This is rain. Not dreish. No, it's dreich! But it's not all gloom and doom. -I feel quite chilled about today. Well, I bought four things yesterday. I think I've got something that might just put out the Braxton fire. -I see what you did there. rather than down the Swanee. a copper bowl for £30. What are you going to spend your money on? Kendal was peopled by all those northern industrialists. I'm going to be looking for Arts and Crafts stuff. having a shopping list doesn't always work. towards the largest of the Border towns, Hawick. this pretty town is known worldwide for its knitwear and textiles. who used to play for the local team. you know, Hawick, Jed, Kelso, Melrose. I played in the Hawick sevens light years ago. Now, that I would have liked to have seen. can hook an antique gem and who will be getting a shoeing at auction. -All right, James. Don't buy anything cheap. Go for broke! owner of one of Hawick's newest antiques shops, Scott McIntosh. -Nice to meet you, James, Scott. Hi, good to meet you, Scott. Great Scott, James looks like he means business. -OK, well, I'll have a good look round. Are there any bargains that you think I should be looking at? Everything's a bargain in here. James is following his plan and asking Scott for advice. Scott's managed to amass quite an assortment. It's a copper chafing dish that's caught James' eye. it comes from the French word chauffeur, "to make warm." So, we've got the burner here, making warm. so it's taken off the silver plating here and revealed its copper body. So, here we are. Sheffield-plated here. the appearance of solid silver but far less expensive. This method is now generically termed Sheffield plate. How much on something like this? What's the best price you could do on that one? I'll definitely take that at 25, that's very kind, Scott. -And another lot for James. -But that's still only two to Philip's four. and it's nice to see Philip's got the roof working this time. so what I've really got to do now is focus on this last job. I've got one thing to buy. You know, keep your buying head on. This enchanting town has captivated people for centuries. the streets here but its most famous resident was Mary, Queen of Scots. Philip's come to meet the slightly less well-known Mary Swann. where is more appropriate than a shop called Bygone Days? I'm on a real mission today. I've got one item to buy. What I really need is a profit, you know? -I quite like those brass bits there. Have you got any other bits that we could perhaps put with it? I've got a couple of pieces of copper in the cellar. If I'm not back in ten minutes, just send a search party for me, please. And off Philip goes again. -There's another saucepan, isn't it? -You know how you tell an old pan? It's where they join the copper together. it's a straight line and on old copper, you've got this zigzag. Can we take it upstairs? -Blimey, that's a good omen. -Walk away, Philip, walk away. Right. So, what we've got is two old saucepans. The larger one has a ticket price of £40 and the smaller is 20. I'd quite like to buy these. But it means I've got to try and buy them at between 25 and 30 quid. -Can I do that, do you think? -I could do the two of them for 30. -OK, I'm going to buy those off you. -You're an angel, thank you very much indeed. -And with that, Philip's shopping is done. the border from Scotland to England, heading to Brampton in Cumbria. around the world by using products with the Fairtrade mark. Today, James is hoping to do some fair trade of his own. Nice to get out of the rain. Now, I've got three more items to buy and I need to beat that Serrell. is owner of the Cumbrian Antiques Centre, Steve Summerson-Wright. -Hi, how are you doing, James? Steve. Oh, you've got so many goodies here, haven't you? so James should be able to source something from his shopping list. -Oh, there you go, there's a nice piece of Keswick. It's got everything you want on it - patent number, everything. It's a nicely-made object, isn't it? century as part of the Arts and Crafts movement. producing trays, bowls and brass bellows like these. skin which is nicely stamped up and a very nicely turned nozzle there. -That's definitely on my list. more about the town's most renowned - albeit temporary - resident. whilst on an official tour in 1566.
is going to show Philip around. -Yeah, good to see you. Mary became Queen of Scotland at only six days old. and producing a male heir. who would eventually become the first King of the united crown. and began looking elsewhere, growing close to one of her advisers. Bothwell was seemingly a charismatic character, a strong character. So, she'd appointed Bothwell by that time Lieutenant General. and he was seriously ill and lying in Hermitage Castle. So, she went to see him. Hermitage Castle in one day and it's an almost 50-mile round trip. and she's hoofing up to Hermitage to see Bothwell. -Bit of a girl, isn't she? -She is a bit of a girl. four months after Mary had given birth, was extremely dangerous. First of all, we have the watch. and it was found almost 100 years later by a local shepherd. Oh, that's a great romantic story, isn't it? and in doing so must have dropped the thimble. route and donated to the house as part of the cult of Mary. they're part of the folklore and the legend that is Mary, isn't it? eventually led to her demise. Queen Elizabeth I, for 19 years and finally beheaded at the age of 44. -So, this is a copy of Queen Mary's death mask? usually they would be white. it painted to make it look more lifelike. Really stunning-looking lady, isn't she? What in your view is Mary's legacy that she left? so if that's not a legacy, I don't know what is. got off to a good start, but he's not done yet. Mirrors are always popular, aren't they? Yeah, that's Arts and Crafts, it's probably more likely Scottish. -I'm no expert on Arts and Crafts, but possibly. You see a lot of Ruskin enamel in here. and theorist and art critic John Ruskin. making enamels or plaques that were mounted on wood or metal. I like that. That's on the list. And Steve's picked out something that's usually more Philip's style. It wouldn't be a puncture in those days, would it? -..your broken spoke or something. so you can take your wheel off and sort your wheel. That is amazing, isn't it? This would be taking Philip Serrell on at his own game. -This is a rural bygone. James is taking a risk, stomping on Philip's rural bygone territory. -How much are these priced at, Steve? -The bellow was at 55. -We could stretch it and let you have him for 45. The mirror, 75. And I'm sure we'd be able to let you have that for about 60. These guys, a chancy £50. It could be a bit rich. It did come in with some other things. If you give me two minutes, I shall go and have a look. Philip will be so jealous if I buy this. and I don't think you can beat a rural bygone like this. Cor, listen to that. He wouldn't be saying it if Philip had bought it. -I'm like the Grim Reaper. That is an offensive weapon, Steve. so I suppose it should stay together. -You can have the jack and the scythe for £40. Well, I'm definitely going to take those. -Could you do the other two for 100, chief? You've got fabulous stock and I'm spoilt for choice. -But I'm very pleased with this. prices of his bellows, mirror and cart jack and get a free scythe. costing a grand total of £195. a dentist's chair, a loo seat, corn grinder and the fire extinguisher. But what will they think of each other's lots? Fire away, chaps. He is trying to out-Serrell Serrell. bellows and I think that's his real banker for this auction. he's found some nice items. item and as for the loo seat, where does one stand on it? Will Philip Serrell be going down the proverbial? crossing the finishing line at auction in Kendal. That's if they ever get there. I think you should just concentrate. You're meandering again, you're over the white line again. What was that? -How'd you get rid of whiplash? village, Greendale, as it was home to the creator, John Cunliffe. though is surely Beatrix Potter. What do you call a drunken snooker player who does strange shots? and who better to tell us what he thinks of the fellas' haul? will be a market for but with the prices, it could be a break-even. -Careful, chaps, you don't want to do yourself a mischief. Let's see what's going to happen. -but James' face does look a picture. I love the way your lots have a theme, Philip. But it's time to start proceedings. Let the auction commence. First up, Philip's corn grinder. £40 if you like, 40. -£40 for a rural bygone. Ten in the centre, thank you. 10, 12, 15, 18, 20. 28 in the centre then and selling at 28. -Could you just wipe the smile off your face? -Just wipe that nasty smile off. Ouch! What a way to start with a £12 loss, eh? Just shut up, that's not a nice look. Neither is the face of a sore loser. Next up, it's James' copper Arts and Crafts bowl. £30? We'll start at 20 then. 20, 22, 25, 28, 30. James, I'm developing a very strong dislike for you. -Get that smug, supercilious smile off your face, please. If you're done then at 48. A solid profit at £18. I got out of that one, didn't I? "Oh, I got out of that one, didn't I?" I don't even like you. Next in the hot seat is Philip's dentist's chair. who wouldn't want this in the living room? Where are we going to go with it for a start? Couple of hundred? Start me at £100 then. Go 50 on the telephone then, 50 on the phone. 60 on the internet, I'll come back to the phone. 65, 70, 75. 95 now. 100, new bidder. 110 in the doorway, we'll sell away then if you're all done at 110. -Do you know? He's nearly choking. He's almost doubled his money. A fantastic comeback from Serrell. That is outrageous, isn't it? Does that mean I'm about 20 quid behind you then? Well, you've put on some weight there, haven't you, chief? Hoo-hoo! That's a bit harsh. Let's see if James' chafing dish can heat things up further. Start me at 20, I will take 20 for a start. Thank you, lady's bid. We're on the internet, you're all out in the room. 32, thank you. With £38 then in the room and selling, all done at 38. And every little counts in this game. You've got that smile on your face again. Please don't do it, James, it's not good. Don't cover that smile. Will you please put your hand down? -Now, it's time for Philip's Edwardian toilet seat. Yep, it just needs a little bit of imagination, that's all. Picture frame, flower arrangement. £10 then, start me. -£10 for the lavatory seat. 10 bid. 12 anywhere? 12, thank you, 12 bid. -I think it's washed its face. I'm going to sell away, the bid's in the room. If you're done then at 22. Not bad, really, considering. So, can Philip's pans pan out for him? Start me at £50. 30 then? £20. Thank you, £20 bid. £30 bid on the front row. £30 only. £30, we're going to sell if you're all done at 30. You've got that look on your face. -You are such a nasty piece of work, aren't you? And that's a loss after auction costs. Now, it's James' turn to give Philip a run for his rural bygone money. £20 if you like. 20? £20? Thank you, £20 bid now, 20 bid. You could have got it for a tenner. 30. 32, we're away on the net, 32, 35, 38. -You're all out in the room. 40, 42, 45, the lady. Bid's on the internet. Have you all done this time then at 48? And at £48, James has just scraped a profit. -Philip's up next with his antique fire extinguisher. James, I'm in real trouble here. £20 bid, 20 bid. 22. We've got lots of interest on the net. 25, 28, 30. 30 bid. 40 bid. 42, thank you in the room. 45, 48, 50, 55. 55 in the room then. If you're all done then... 60. Put it...put it... Put it down, put it down. £75 then. In the room and selling, all done at 75. Well done, Philip. He's tripled his money. You made about 40 quid on that. -Yeah, and I thought I was in the doo-doo there. But let's see if James' next lot can puff up his profits too. Are we going to give 100? £50 then, somebody? £50, surely somewhere at 50. Yes, 50 on the net. 55 on the net now. 75, 80. 80 bid. I'll take five in front if you like. Don't lose them to the net now. £80, we're going to sell. 85 in the room. 90 now. 95. 95. 100. £100 on the internet, I'm going to sell if you're all done at 100. That's not bad, is it? It's good. I'm pleased with that. -Smug, smug smile's come back. -I know. You're allowed a small smile. Especially when you've more than doubled your money, James. -I think my mirror's going to struggle here, don't you? I hope so. I mean it might do, yes. Let's see, as finally, it's James' Arts and Crafts mirror. £50 if you like, somebody for a quick start. £50 on the net bid. 85 if you like, I've 80 on commission. 90 now. 90 bid. 95 in the room. -Don't rub it in, James. -Come on, keep going, Kendal. -110. You're both out on the internet. 120. 130. Selling at 130. Jeepers. James has doubled his money again. What a way to finish, eh? Well, I think you did very well with that mighty dentist's chair. -That will live with me. I've got to learn to shop clever. Shop Braxton, shop clever. giving him £255.88 to play with next time. James has built on his lead on this leg. totted up a profit of £103.48 so now has £356.04 to use on the next leg. There's now just over £100 between them so the gap is widening. I've got to say to you, James, hats off, mate, you did really well. I mean, you bought for the sale, didn't you? I bought for the Lake District. So, what are you going to buy for the next one? We're in the industrial heartland of England, aren't we? -So, what are you going to buy? -Over-engineered items? I'm on it, mate. It's a king's random, isn't it? ..and James is always prepared. On the second leg of their road trip, Phil Serrell has some catching up to do. Can he claw back the deficit? Or will James Braxton pull further away as the pair cross the border from Scotland towards an auction in Kendal?